You may notice a bus on the #99 Downtown Trolley route in downtown St. Louis that doesn’t look like our other MetroBus vehicles. That’s because BYD Co. Ltd. has loaned us one of its electric buses to take for a two-week test drive, and you may be lucky enough to catch a ride on it. 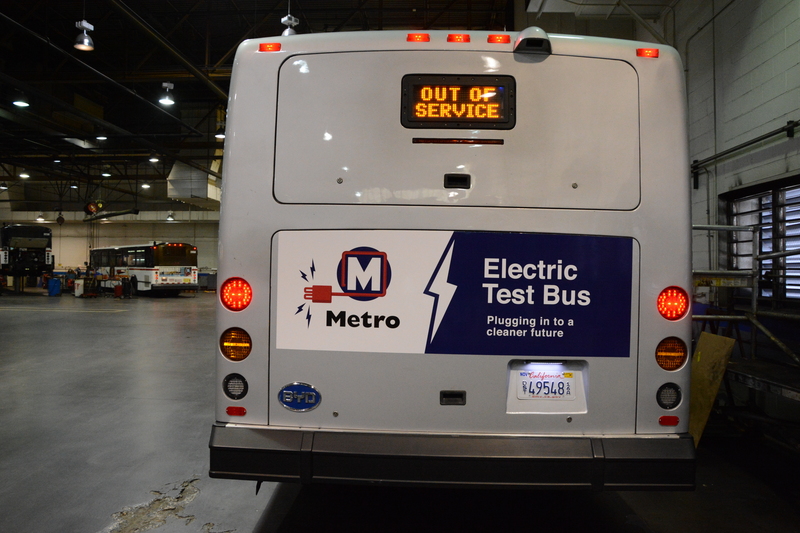 We are operating the electric bus in downtown St. Louis through April 25. Metro is always looking for options to increase our efficiencies, capabilities, and ways to maximize the taxpayers’ return on investment, especially with environmentally friendly alternatives. All components of the electric bus, from the motor to the braking system and windshield wipers, are powered by its two electric batteries. The 40-foot bus can safely operate on a single charge for about 150 miles compared to about 500 miles on a full tank of gas for our current diesel-powered MetroBus vehicles. 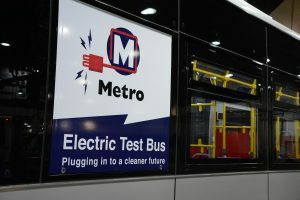 While the electric bus technology has made major advances in the last 15 years, Metro would like to see the technology produce a longer range before needing to be recharged. Charging infrastructure costs would have to be considered as well as maintaining the charging areas. The initial investment in purchasing an electric bus would cost nearly double that of a diesel-powered bus, but would result in significantly lower fuel, parts and labor costs and less maintenance needed over the long term. The batteries on this particular bus take about four hours to recharge. Both electric and diesel buses have the ability to operate up to 12 years or about 500,000 miles. However, due to our excellent maintenance program, we’re able to extend the life of buses to 15 years or between 750,000 to 825,000 miles. The current test drive is the first of three electric buses we will be testing this year, all made by different companies. If you would like to get a closer look at the BYD Co. Ltd. electric bus, you can check it out at Earth Day in Forest Park on Sunday, April 26. We’ll have more information about that coming up. If you happen to board the electric bus on the #99 Downtown Trolley route, we would like to know what you thought about it. Send us your comments below. Some cities have looked into charging through induction at bus stops. Since Metro idles their buses and passengers mid-route in parking garages, there are opportunities throughout the day for passive recharging. With induction charging, there’s nothing to plug in, you just put the charger in the concrete under where the bus idles. If a bus battery is found, then it gets charged. Not for four hours, but for twenty minutes or so multiple times a day. It’s potentially a great bit of public infrastructure because once bus shelters are reimagined as little powerplants sheltered by solar panels, they can serve a lot of other functions as wifi hotspots, emergency shelters, or backup power for Ameren. The Taum Sauk Hydroelectric Power Station could be easily replaced by decentralized public and private batteries if Ameren made the right investments. And, thank you for putting bus numbers on the back of the bus! They should totally be on all four sides. Daron, we’re exploring all of our options when it comes to the possibility of adding electric buses to our MetroBus fleet and that includes visualizing what the infrastructure may look like. If we were to add electric buses, would we charge from a central facility, or charge vehicles by an overhead catenary wire (similar to our MetroLink vehicles) or use inductive charging technology like you mentioned. All of these are possibilities we’d consider if were to move forward with electric technology. This. I wish you guys would expand this more. I know 150 miles per 4 hour charge is less than a 1 full tank fill up but this is more important to bringing our city into the future and not relying on fossil fuels which will in time be more expensive as renewable electric sources are ever increasingly following the pace of technological cost reduction and efficiently. It might take more buses to cover the city and it will cost more upfront. BUT the impact of having a city metro powered by electricity. Is a powerful statement of forward thinking. It wins votes at the ballot. It puts money in the pockets of our state from efficiently. It makes our air cleaner. It builds up the ideas of those who use your services most, the impoverished and socially conscious. This is a step in the right direction, please be willing to tke the next. Zachary, the electric test bus we are demoing for two weeks has the capacity to safely operate 150 miles on one single charge. While this is quite an achievement over the past few years in electric battery technology, we’re open to explore other bus models that may offer an expanded range. In fact, this isn’t the only electric bus we’ll be testing this year. We plan to test two other electric buses made by two other manufacturers later this year. What it all boils down to is how we can provide the best environmentally-friendly alternative while maximizing the taxpayer’s return on investment. Nice bus, not silent but fairly quiet when moving. Still rides like bus. The biggest plus I noticed was standing next to it as a pedestrian at a stop light, none of the noise and awful diesel engine exhaust and heat. Had a chance to ride the electric bus and I love it. It was quiet and rod smoothly along St. Louis’ bumpy roads. 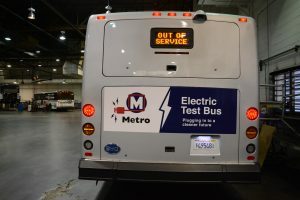 I hope there will come a day whe electric bus are seen all over St Louis. This is great to hear Michelle! Thanks for riding! I think electric buses would be a major step in contributing to STL being a more healthy, forward thinking city. Aren’t there existing routes or venues where the current range limitations aren’t so severe, e.g., a Forest Park circulator that is only operating part of the day. Personally, I think this would have been a better solution than the Loop Trolley for probably a fraction of the cost. I wonder whether single EV buses could be crowd-sourced. Is there a mechanism for direct tax-deductible donations to Metro for specific purposes? At 3.52 mpg for the current buses (http://www.nrel.gov/docs/fy08osti/43486.pdf), I’d think that moving in this direction is mandatory!